Join our E-mail list to receive 20% off your first purchase. Plus, be the first to know of exclusive promotions only available to Perry Ellis subscribers. As they say, it's what's on the inside that counts. And what's inside your pants needs an Original Penguin makeover. Make the Venice vibe your Summer theme with our Hollywood Surf Club collection. Collared and confident, polo shirts are the final word on men’s fashion, and Original Penguin is the final word on sharp, stylish polos. It’s time to stock up on bathing suits that are stylish and cool. 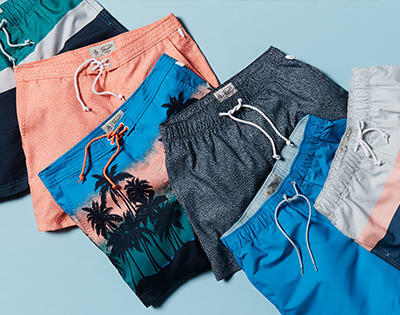 Shop our selection of tropical printed swim shorts, gingham style, color block and traditional stripes. Available with button closure, zipperless closure for max comfort and velcro closure. Original Penguin chino pants are the ultimate casual pants. Find what fits your frame with our original options. We’ve got just the cut you’re looking for. Made of cotton and spandex to stretch to your comfort and machine washable for easy upkeep. 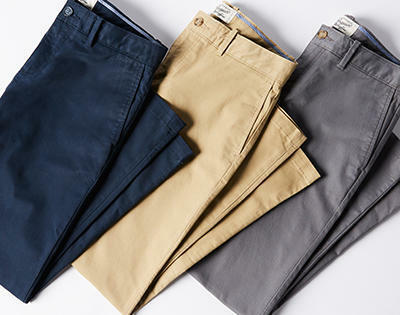 Shop straight fit, slim fit and skinny fit chinos. 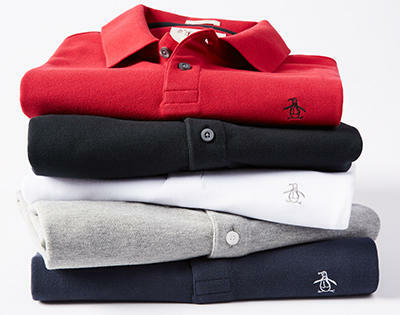 Shop the Original Penguin collection of men’s casual shirts. 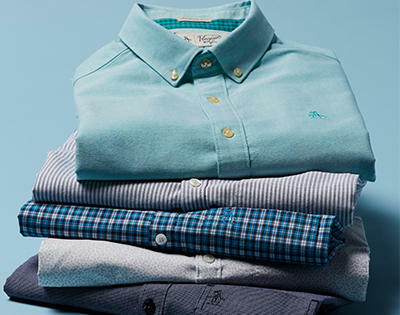 You’ll find laid back short sleeve shirts and versatile long sleeve button down options. Embrace a kick-back lifestyle, everyday. Original Penguin has the styles you’re looking for. Our men's apparel keeps the legacy of style icons of the past alive with a fresh and cool approach that appeals to the innovators of today, too. From the creative wanderer to the business-savvy guy, our collection lets you express your own unique style all day, every day. We have a huge selection of plaid shirts, swimwear, chino pants, our iconic Earl Polo shirt, and so much more. So if you're looking for casual shirts and pants in regular, slim or big and tall sizing, we've got your back. Check out our Store Locator to find us in your area or head to OriginalPenguin.com. Established in 1955. In 1955, a sportswear icon was born from the most unusual of places. Fueled by a little bit of whiskey, Abbot Pederson purchased an unlikely drinking buddy for his flight home in the form of a stuffed penguin he named Pete. A quip from the seductive stewardess onboard led Pederson to embroider this character on his new shirts. Join our insiders program and earn 1 Perk Point for every $1 spent, online or in-store. Hit 250 Perk Points, and get a $25 reward. Every time. Copyright 2017 PEI Licensing, Inc. All rights reserved.